We specialize in radiation and corrosion chemistry. We investigate the chemical mechanisms of the corrosion of metals and alloys under radiation. An essential aspect of this work is modelling the concentrations and rates of production of the reactive compounds and radical species produced by radiation in various media, under a range of environmental conditions. 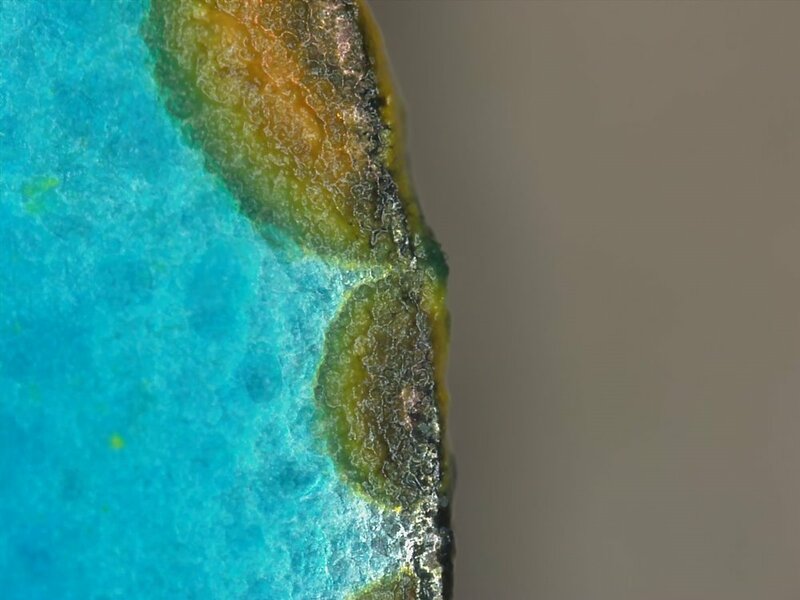 We are developing a more comprehensive and quantitative understanding of the influence of these "radiolysis products" on the behaviour of materials, and in particular the corrosion of metals. 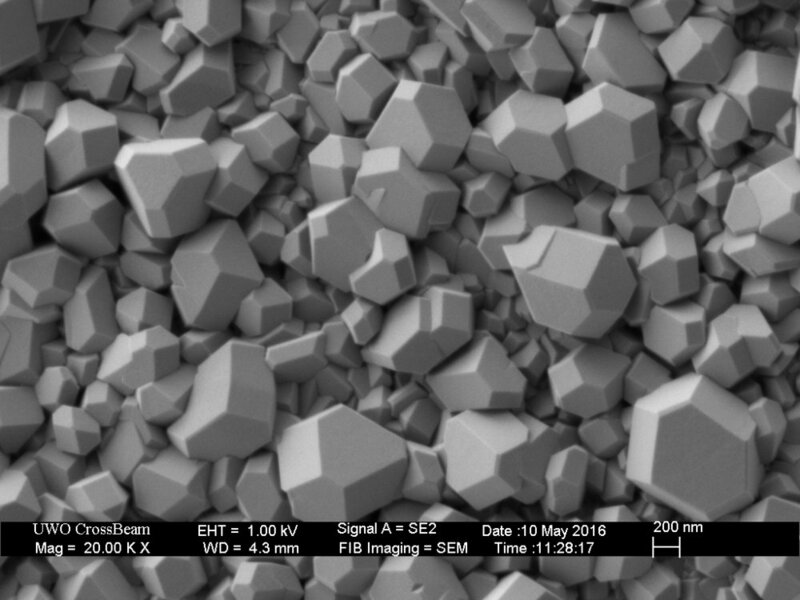 We also study applications of radiation chemistry in materials science (for example, nanoparticle formation). Another of our current projects involves developing methods for enecapsulating or remediating radiocontaminated materials. We are currently looking for graduate students and postdoctoral fellows with strong chemistry backgrounds to join our group. If you are interested, fill in the contact form. Modelling of radiolytic production of nitric acid. Making iron oxide nanoparticles using gamma radiation. Ryan Morco is the recipient of this year’s R.E. Jervis Award provided by the Canadian Nuclear Society. Jennifer Shin has been awarded a 2019 Roy G. Post Scholarship. Dan Guo has successfully defended his PhD. Congratulations, Dan! Razieh (Rose) KarimiHaghighi, a PhD candidate in the Wren Group, has been awarded a Women in Nuclear Canada Pioneer scholarship in the graduate student category. Dan Guo, a PhD candidate in the Wren Group, presented a paper at the Electrochemical Methods in Corrosion Research conference in Cambridge, UK. Rose Karimihaghighi, a PhD candidate in the Wren Group, has been awarded an OGS scholarship. Dr. Joseph gave a presentation at the 2018 Information Exchange Meeting on Super-Critical-Water-Cooled Reactors in Montreal. RAMPS researchers visiting Antelope Canyon in Arizona while attending the WM2019 radioactive waste management conference in Phoenix. Thao Do and Mi Li in front of Mi Li's poster at the 2018 Aqueous Corrosion Conference GRC. PhD candidate Ryan Morco discussing geopolymers at a recent meeting with our industrial partner Ontario Power Generation. Alloy 800 after corrosion for 5 hours at in deaerated water at 400 C and 25 MPa. 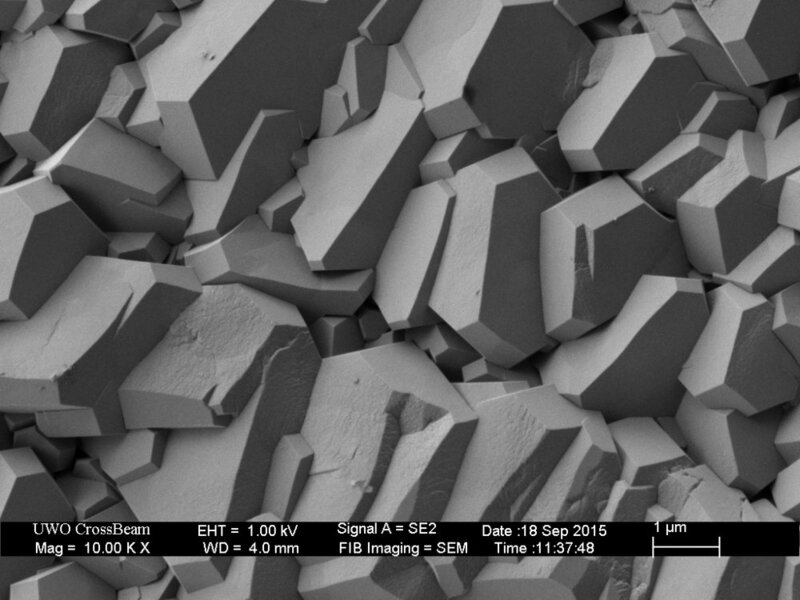 The crystals formed on the surface are magnetite. 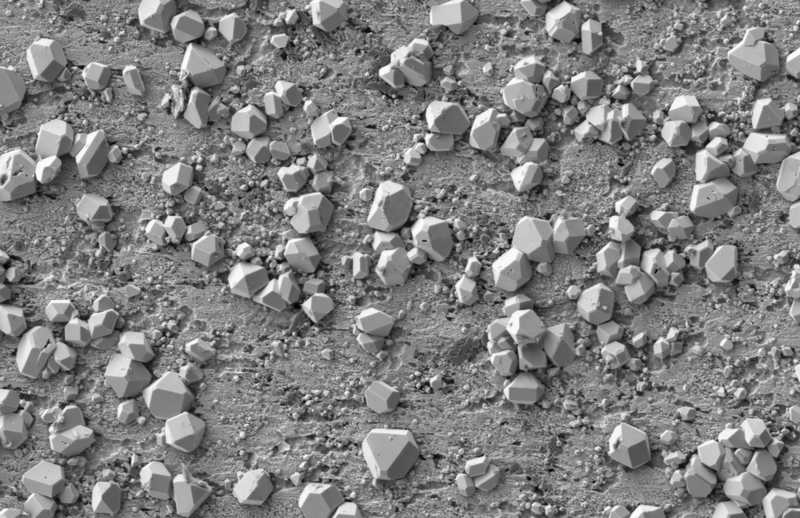 SEM image of copper metal deposited from copper sulphate solution by reduction on a carbon-steel surface. 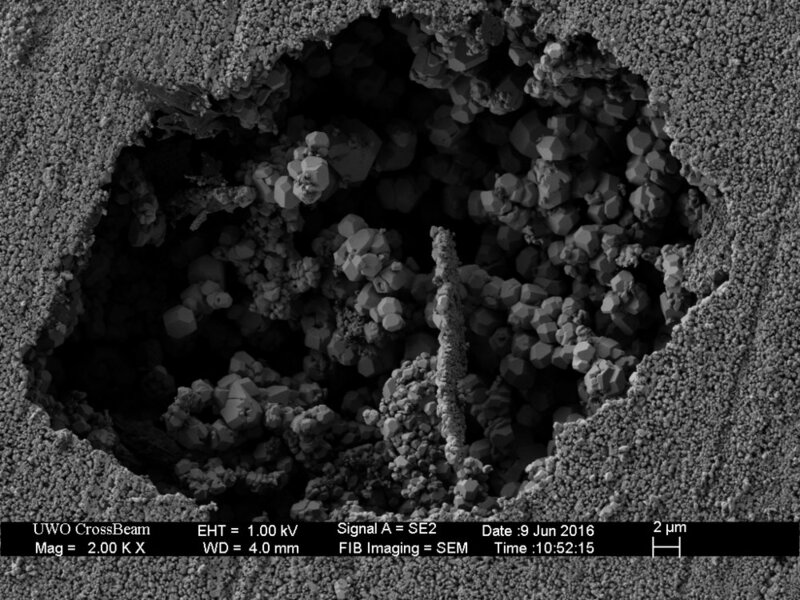 Cuprous oxide crystals forming inside a pit in a copper metal surface corroded in solution under gamma radiation. 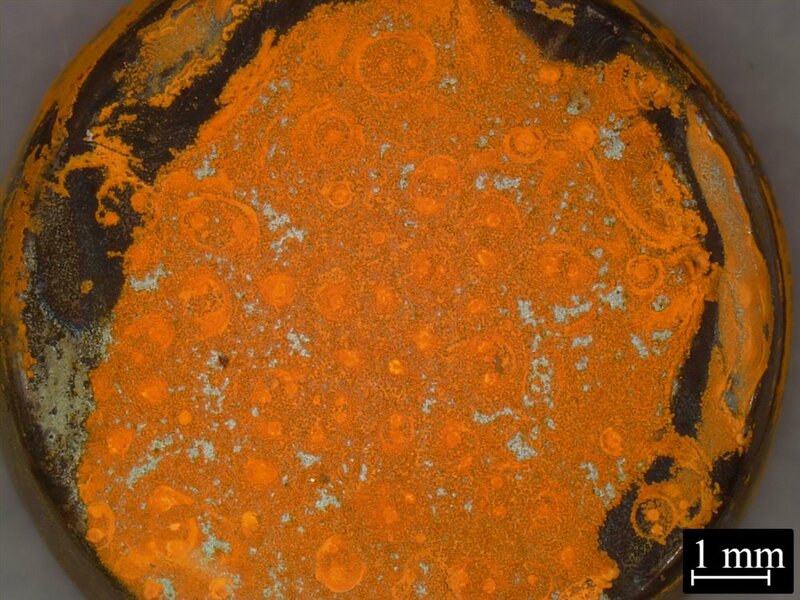 Concentric ring patterns of cuprous oxide formed from the corrosion of copper in solution under gamma radiation.